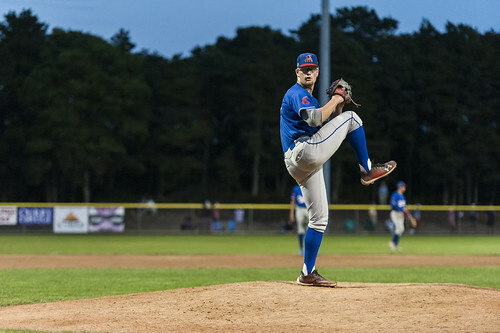 After sweeping the Harwich Mariners in the first round of the postseason, the Chatham Anglers (2-0) will face the Brewster Whitecaps (2-0) in Game 1 of the East Division Championship Series on Wednesday night at Veterans Field. Brewster — the No. 4 seed — stunned most by blowing past the top-seeded Yarmouth-Dennis Red Sox in the first round. The A’s first-round win marked their first time advancing in the playoffs since 2016, when they needed three games to outlast the Harwich before getting swept by Y-D in the championship series. The Anglers have not won the East Division Championship since 2001. Ten different active Anglers players had a .300 batting average or higher against Brewster during the regular season. John Rave (Illinois State) and Jorge Arenas (Stetson) each had six hits in 14 at-bats against the Whitecaps while Spencer Torkelson mashed two homers and seven RBIs in 19 at-bats. As a team, Chatham possessed a .297 batting average against Brewster, raking 57 hits while striking out 56 times. The two projected starting pitchers for Game 1 are two left-handers — Chatham’s Jeff Belge (St. John’s) and Brewster’s Reid Detmers (Louisville). Belge, who ranked fourth in the Cape League in innings pitched during the regular season (35.2), will take the bump for the first time this postseason. The second-year Chatham player was the starting pitcher in Game 3 against the Orleans Firebirds in the 2017 EDS, conceding three runs on four hits in a season-ending 3-1 defeat. Detmers faced Chatham twice during the regular season. On June 20, he gave up three runs on six hits in 4.1 innings as the Whitecaps fell on the wrong end on a seven-run shutout. It was one of two contests during the regular season in which the A’s held Brewster scoreless at Stony Brook Field. On July 17, Detmers allowed four hits and a run in as the Whitecaps defeated the Anglers, 8-6. In the regular season, Detmers made seven appearances, posting a 4.55 ERA and 29 strikeouts in 27.2 frames of work. The Whitecaps snuck into the playoffs after the Orleans Firebirds dropped 12 of their last 14 games to slide into last place in the division. Brewster — who sported a league-worst regular season 13 wins — won or tied five of its last 10 games, including a 4-3 victory over the Firebirds. Since the postseason began, however, the Whitecaps have come alive. In Game 1 of the EDS against Y-D, an RBI triple from Ray Alejo (Central Florida) in the seventh inning broke a 4-4 deadlock to give the No. 4 seed and eventual 5-4 win. In Game 2, the Red Sox had a one-run lead heading into the bottom of the seventh before Brewster exploded for 11 runs in the final two innings, winning the game, 12-2, and the series. Six different Whitecaps players tallied an RBI in the game. Alejo and Ike Freeman (North Carolina) went a combined 5-for-10 against Chatham this season while Gage Workman (Arizona State) tallied five hits and drove in seven runs in 20 at-bats. During the regular season, the Whitecaps ranked last in the league in runs scored (178), hits (338) and on-base percentage (.320).